Effectively kills and controls a large variety of insects in organic gardens. Made from all natural ingredients and works quickly to kill insects. Use on both indoor and outdoor plants. Available in ready-to-use and concentrate forms. Earth-tone Insecticidal Soap for Gardens has different options and/or variations, please choose below. Great for use in organic gardens, this organically approved insecticide kills a wide variety of insects such as: adlegids(woolyaphids), aphids, lacebugs, mealybugs, mites, grasshoppers, leafhoppers, scale insects, plantbugs, sawfly larvae (pear & rose slugs), psylids, tent caterpillars, thrips, spider mites, earwigs, and whiteflies. All natural and made from plant oils. Works quickly for instant results. Comes in a Ready-to-use 24 oz. spray bottle or a 16 oz. concentrate. Earth-tone Insecticidal soap controls many common pests outdoors in the garden and indoors on houseplants. Derived from plant oils this unique formulation is approved for organic gardening. Thorough coverage is important. Make sure you spray all areas of the plant including the underside of leaves for best control. Treat weekly or bi-weekly as needed. 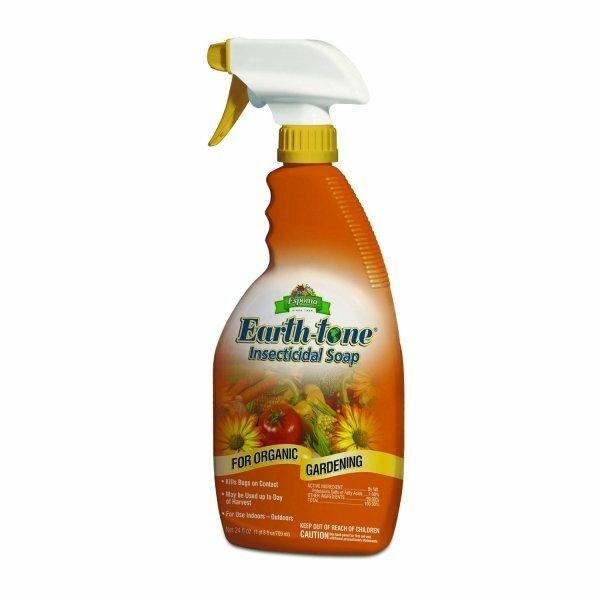 Earth-tone Insecticidal Soap can be used up to and including the day of harvest on food crops. For use indoors, outdoors, and in greenhouses on: fruit & nut trees, corn, melons, tomatoes, vegetables,figs & small fruits, citrus, houseplants, ornamental and bedding plants, ornamental & shade trees.